SCIENTISTS WANT TO TURN YOUR CARBON EMISSIONS INTO FUEL. They’re getting better results than expected. In a new twist for waste-to-fuel technology, scientists at the Department of Energy’s Oak Ridge National Laboratory (ORNL) have developed an electrochemical process that uses tiny spikes of carbon and copper to turn carbon dioxide, a greenhouse gas, into ethanol. Their finding, which involves nanofabrication and catalysis science, was serendipitous. The team used a catalyst made of carbon, copper and nitrogen and applied voltage to trigger a complicated chemical reaction that essentially reverses the combustion process. 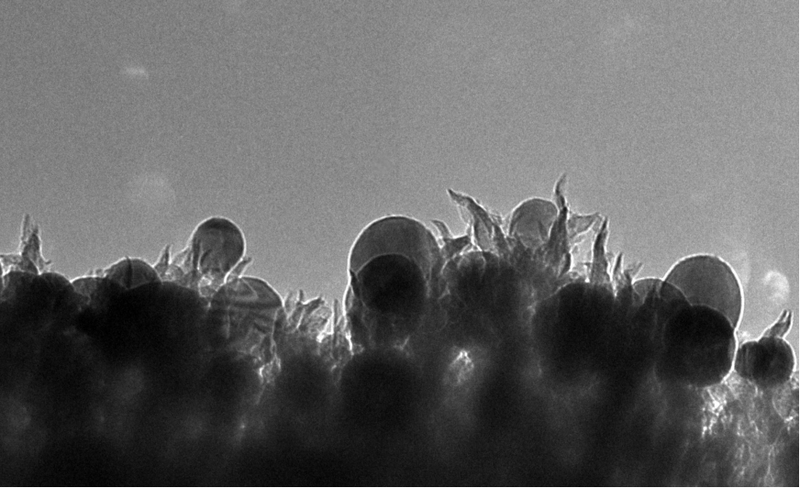 With the help of the nanotechnology-based catalyst — which contains multiple reaction sites — the solution of carbon dioxide dissolved in water turned into ethanol with a yield of 63 percent. Typically, this type of electrochemical reaction results in a mix of several different products in small amounts.